Good morning! 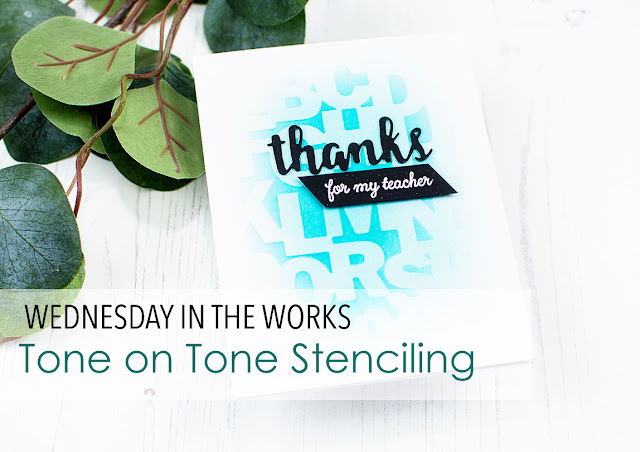 Heather here today to share a fun tone-on-tone stenciling technique using a Confetti Cuts Cover Die, some RC Dye Ink, and a sentiment built from a few additional Reverse Confetti sets! Today's card is creating a fun teacher thank you note! 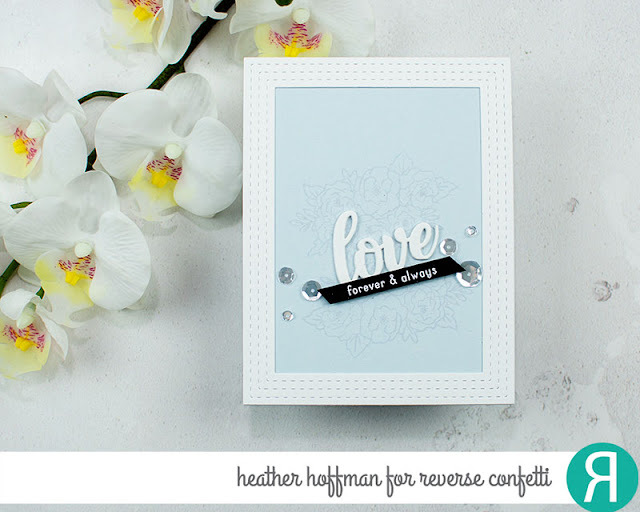 It such a fun way to stretch your dies by using them as stencils - and opens up so many design possibilities! The ABC Cover Panel is super fun for this! The sky is the limit for colors - tone on tone means you don't even have to combine more than one color. I love the way this Lagoon Dye Ink just pops on the background. 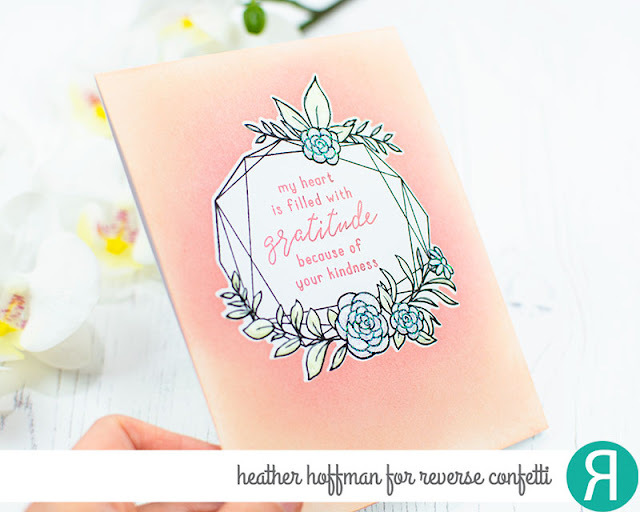 The perfect finishing sentiments for this background come from Hello & Thanks Label Confetti cuts and Honey Bear stamp set. What color would you love to make this in? Greetings! 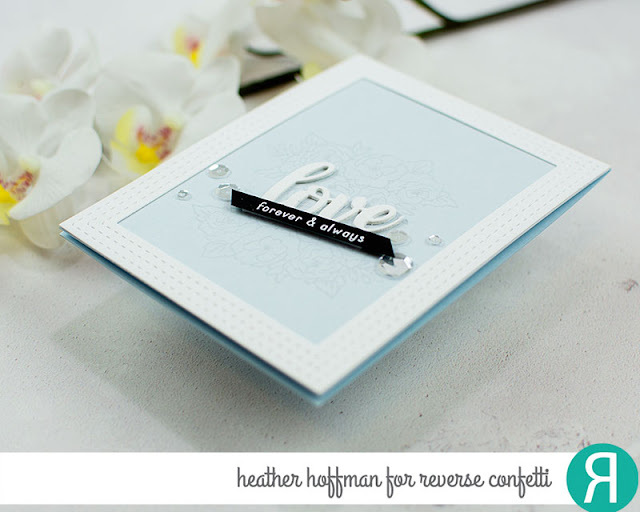 Heather here today to share a simple one layer card with some masking using some Stamps and coordinating Confetti Cuts from Reverse Confetti! I used the beautiful Floral Gem stamp set and created a mask with the coordinating Floral Gem Confetti Cuts. I did some ink blending on the background with a combination of Peach, Bellini, and Coral ink to create an ombre blended background. The sentiment is from Sentimental Gems - the perfect coordinating set to Floral Gem. To finish off I used some Nuvo Blizzard Glitter drops on the flowers for some sparkle, and Nuvo Key Lime Jewel drops on the leaves for a hint of color and shine. 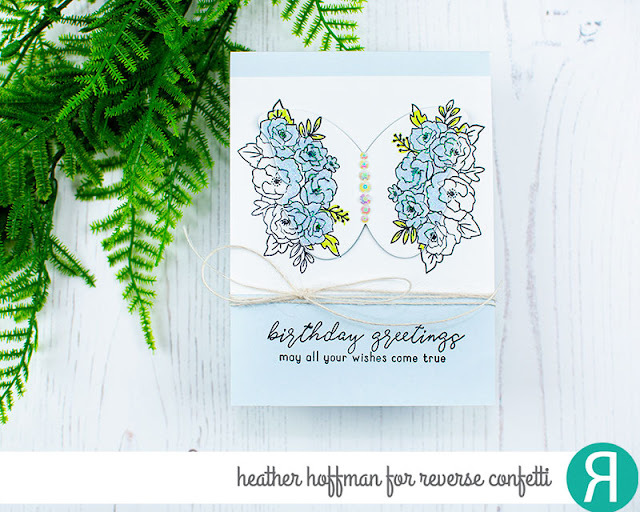 I love how this card is nice and flat and easy to mail - but still has lots of interest and the illusion of dimension! 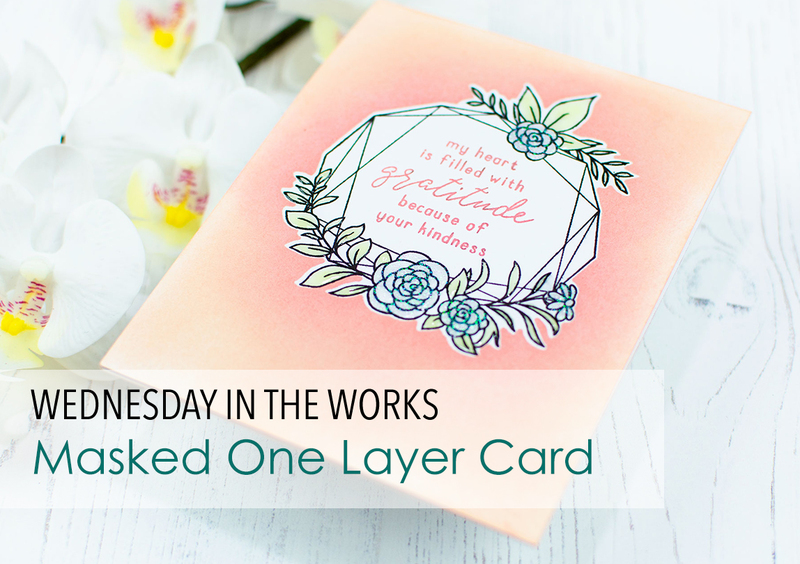 And - using the coordinating Confetti Cuts means you don't even have to do any fussy cutting for your masking! Hello! 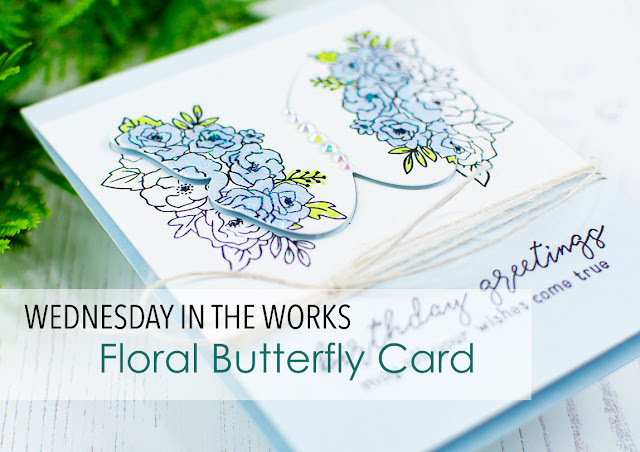 Heather here today to share a fun Floral Butterfly card with a unique spotlighting technique and using some beautiful stamps and Confetti Cuts from Reverse Confetti! For this card, I used just the largest butterfly die from the Butterfly Dreams Coordinating Dies. I then stamped the lovely florals on there using Hatbox Florals - a more recent release. 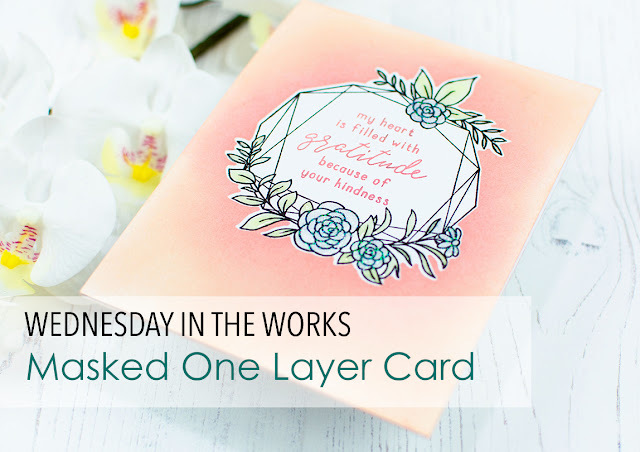 My original plan was to just use that as an embellishment, but my plans changed midway through making this card - don't you love when that happens? I ended up turning it into a popped up spotlight card with lots of sparkle! 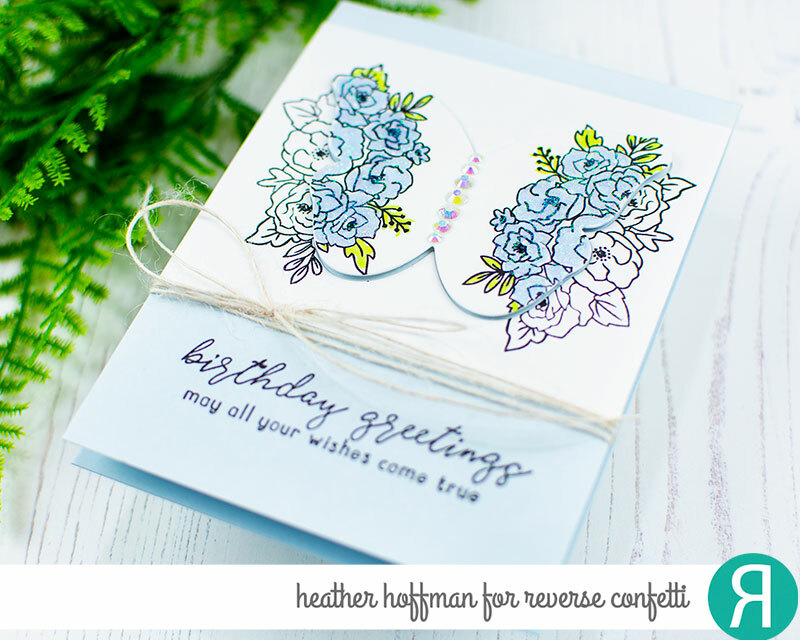 Sentiment is from Tall Blooms, and the cardbase was created with Mist Cardstock - one of my favorite shades of blue cardstock! Greetings, 'Fetti Fans and welcome to our monthly hop! This past weekend I spent at a retreat with all of these lovely ladies. It's always wonderful to get away and get my creative spirit boosted. I never get anything done and I am sure the scale is not going to be my friend when I weigh in tomorrow, but it was fun and every moment cherished. I had planned to make a card to share upon my return, but unfortunately my flight was quite delayed, so I will send you off to now to see the Confetti Crew creations. I'm going to plop into bed and breathe again after that plane ride. The flight attendant literally came over the intercom after we landed and **congratulated** the flight deck on getting us home safely. Yea, it was a little bumpy!!! Olga with you today and I'm glad to share with you my cards for Confetti Camera for the first time. I'm often making a couple of cards, it saves my time and I think that every next card version will be better than the previous one, so I created two versions for a thanks card. 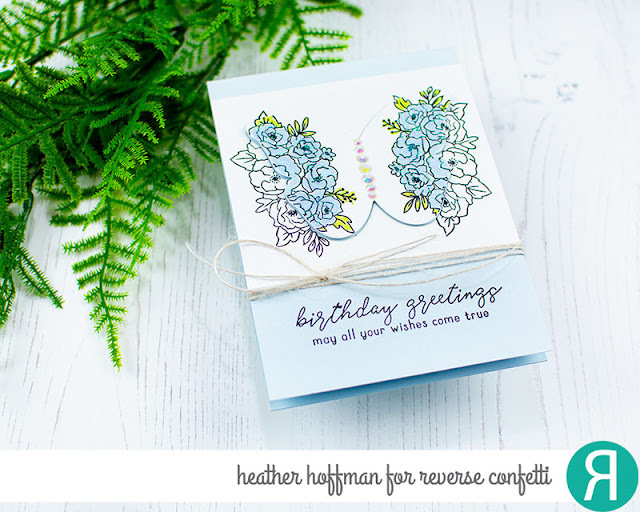 For the beginning, I stamped the bouquet of Hatbox Florals Set twice and colored it. Than I applied Confetti Cuts to it. I toned one cardstock with blue shades and another with orange shades. I applied Polka Panel Confetti Cuts to it. Than I used Darling Dots 6x6 Paper Pad and Stitched Note & Frames Confetti Cuts for creating another element of my background. I stapled it together and glued it to the base for each cards. I used Thanks & Hello Word Duos Confetti Cuts and the sentiment of Mod Floral Stack Set for the title. I hope, You like my cards and have a nice day! Hello 'Fetti Fans! 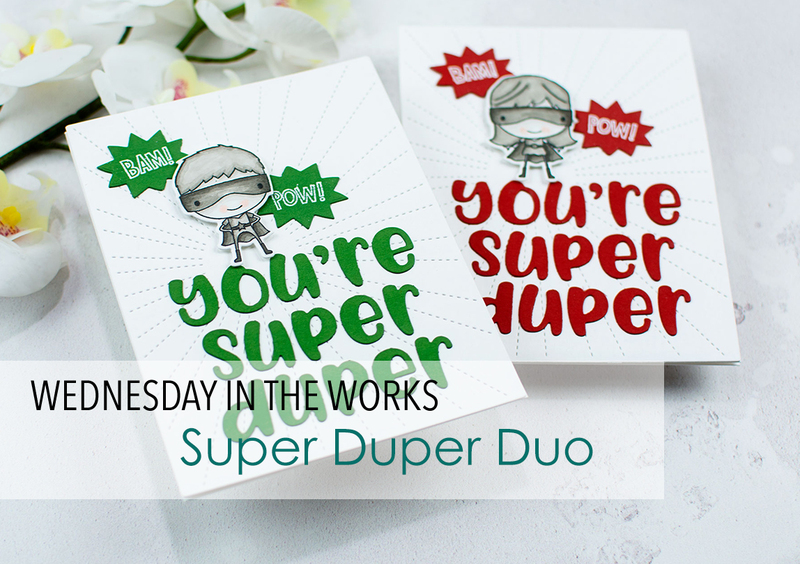 Heather here today to share a this super duper duo of cards! 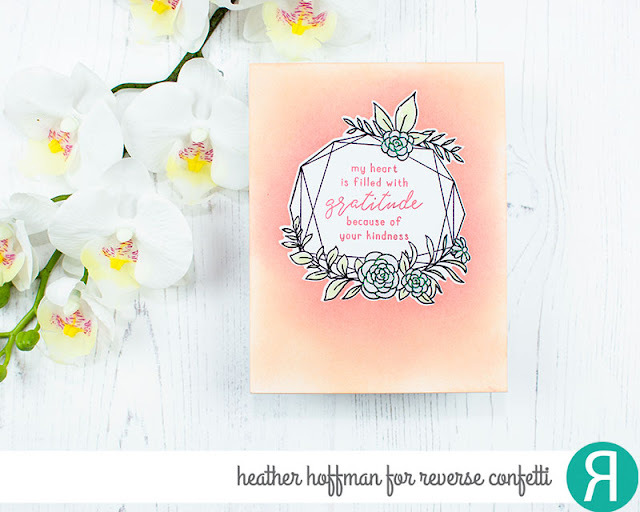 Today I'm sharing how I put these cards together - as well as a couple tricks for working with word dies that have individual letters like this set! I love making both a boy and girl version of the same card - great way to use one card design and get lots of bang for your buck! Both cards used the same stamps and dies - So Super, You're Super Duper, and Stitched Rays Cover Panel - then a different color cardstock. The girl version uses Salsa, and the boy version uses Avocado. It's also fun sometimes to use coordinating dies without all of the intended stamp images - like I did with the starbursts from So Super Coordinating Confetti Cuts with the "bam" and "pow" stamped on, but not the outline of the image. Howdy, 'Fetti Fans and Happy April! It's a new month and time for a new STOCK YOUR STASH challenge! The SYS link list will be open from the 1st until noon CST on the 29th of the month. Click the "Play Along..." button on our sidebar to go current link list post. Ok, it's your turn to show us your creations for MOMS, DADS & GRADS! 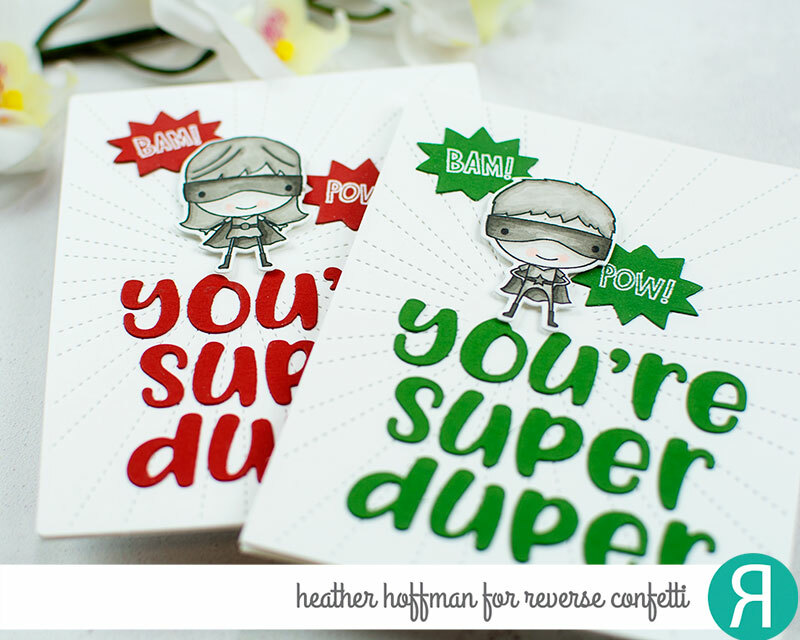 I’m smitten with the So Super stamp set with coordinating Confetti Cut dies! I think they’re perfect for everyone on your list. I thought it would be fun to see two different looks made with the same products.. one for Mom and one for Dad. After all, who can you always count on to save the day? I kept the layout very similar for both cards with very subtle differences. I chose a bright yellow background with a touch of purple and lime for a feminine feel for Mom. The sun in layered confetti cuts is shining bright over the city – it’s going to be a great day. The bright colors add to the comic book appeal to the images. My “Dad” card has a kraft and tangerine background with black and blue accents. There are two male super heros in the stamp set. I’ve added one bounding over the city, and the second is ready to spring into action with his trusty sidekick. 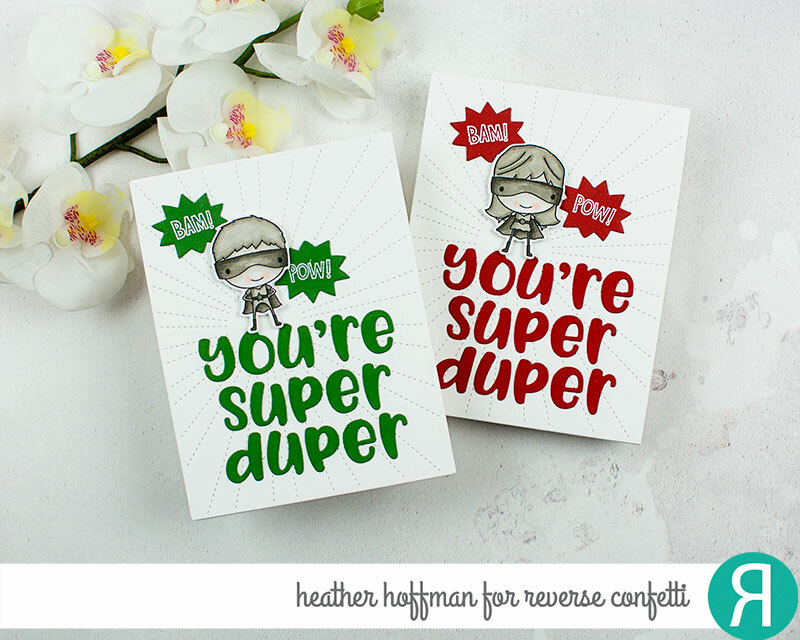 Everyone loves to feel like a kid, and I think both my folks will adore these cards. Greetings! Heather here today to share a soft floral love theme card using some of the newest releases from Reverse Confetti! 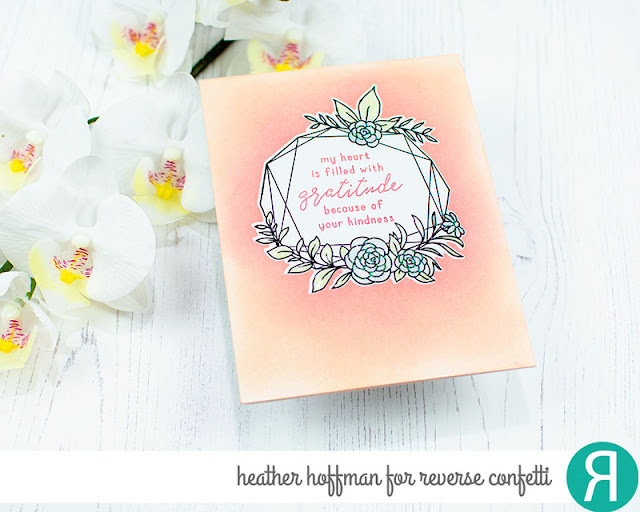 I love the soft effect you get from tone on tone stamping - especially when it involves florals like these lovely ones from Hatbox Florals! I used Mist cardstock AND Mist dye ink to create this look. 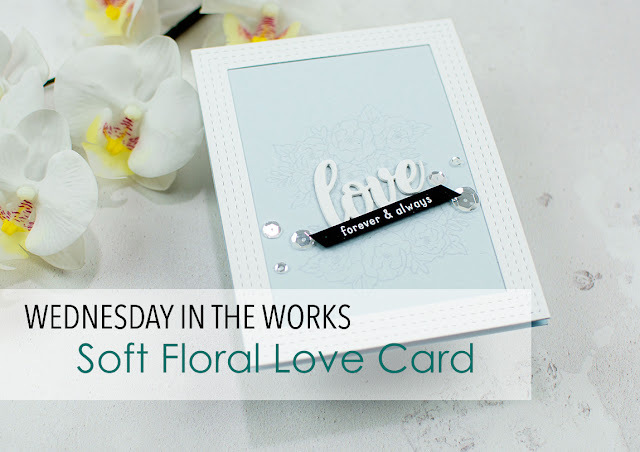 Paired up with a frame from Stitched Note & Frames Confetti Cuts, Love & XOXO Word Duo Confetti Cuts, and a tiny additional sentiment from the must have Word Up stamp set - you have a perfect simple and sweet card!